Here are some information which can be useful for those who are coming to Rome for the first time. Rome is such a big city and time is never enough to see it all, so you need to do a selection choosing main sights or planning a trip taylor-made on your specific needs. In a nutshell, we can say that the main attractions in Rome are: St. Peter’s church and Vatican Museum, Colosseo with Imperial Forums and Palatine hill, the main squares such as Piazza Navona, Campo de Fiori, Trevi Fountain, Pantheon etc. After Vatican Museums, other interesting museums are Galleria Borghese as first, then our favourite which is Palazzo Massimo alle Terme. Rome is rich of large and elegant parks, the more central one and the closest to our apartments is the park of Villa Borghese. We’ll start talking about those attractions which might be wiser being booked in advance during peak season (Spring, early Summer, Autumn and festivities). Then, prepare yourself to scroll down the page as we have many information for you. This is the official Vatican web site and they also provide for guided tours. 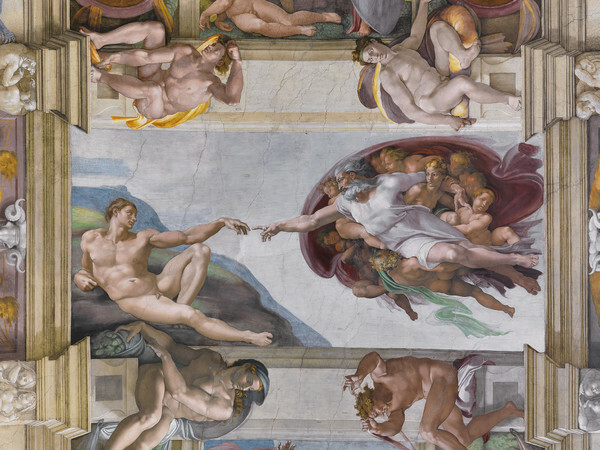 The visit at the Vatican Museums includes the visit to the Sistine Chapel, masterpiece of Michelangelo, you can see a picture below. St. Peter square and the church are free admission, of course, but there are metal detector gates to pass through and this can take a little bit of time during peak season. Palazzo Massimo alle Terme is probably overshadowed by the two other museums previously described, but it is a good alternative for those who cannot find availabilty for the strict admission time of Galleria Borghese. This museum doesn't need advance booking and there's not line usually. Usually, there is always a queue also to get inside Colosseo, but you can avoid the line going first to visit the Imperial Forums and Palatine hill. The admission fee is a combo ticket for all the three areas, but most of the people go first to see the Colosseo, so once you have your tickets purchased at the Forum’s ticket office and after your visit to the Forum, you can get inside directly to the Colosseo without queuing. Read everything and make well your considerations before buying it, it has a price. Piazza Navona, piazza della Rotonda, Campo de' fiori, piazza di Trevi, piazza di Spagna: those are the names of the most famous squares in Rome. 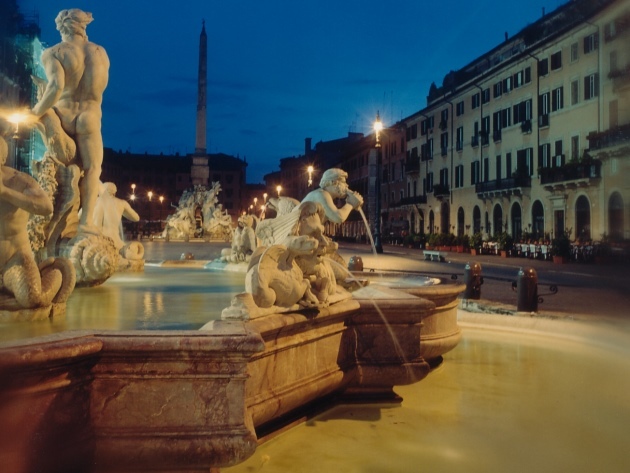 You might better know them as Navona square, Pantheon square, Campo de' fiori, Trevi fountain and Spanish steps. Free admission, of course, they are beautiful and interesting to see during the day and by night. Whilst surrounded by so much culture and history, visitors should not forget that in Rome prices for clothing and leather goods are quite interesting and they would better take advantage of that. There’s a lively street full of shops located near the apartment: via dei Giubbonari, which is a small street packed with shops of local brands. Some other very interesting local brands shops are in via dei Coronari, quite and less crowded. At your arrival, we'll give you more detailed information and shops address. Just ask us. In this paragraph there is a list of monuments and sites which are attractive for young visitors but interesting for everybody, so if you are not travelling with young family don't skip it all but go to read the starred ones, because they are good for visitors of all ages. Rome is an easy city for children: the beautiful monumental squares are traffic free with much space to run around, there are plenty of ice cream shops (gelaterie) selling good artigianal ice cream, and pizza and pasta which will make easy any meal time. Seeing in person one of the most popular monument of the world is not something that happens every day, when you are a child. At the first floor there is also a beautiful book shop with many books in several languages with didattic and entertainment purposes which can help the kids to have a better idea of what the monument was meant to be in the past. St.Peter’s Dome: going up to the dome by steps would be fun for kids. All your family will enjoy the interior view of the cathedral from the base of the dome and a stunning, panoramic view of the entire city of Rome on the top. Be aware that there are about 300 steps and it can be a hard climb. An elevator makes possible skipping only a part of the stairs, not the whole. A nice optical illusion: Piazza San Pietro (St.Peter's square) is an ellipse, so standing on one of the two focus (which are marked on the floor) you will find out that the colonnade, due to an optical effect, seems composed of a single row of columns instead of four, giving a nice illusion of empty space and see-through view. Another exciting optical illusion, indeed no, two! The Church has an amazing, colorful fresco which fools the eyes into thinking that the ceiling is extraordinary much higher than it actually is, featuring a painting that reproduces exactly the same architectural elements and columns of the real church and characters who seem to come out from the painting. Such intriguing. As this effect would not be enough, going ahead and looking for a specific point on the marble floor and standing on it, look up to the ceiling to suddenly see that it became an incredible dome. You can go to see this church whilst visiting the squares, since it is at half way between Pantheon and Trevi fountain. The Vittoriano, or Altare della Patria, is the only monument in white marble of the city. It is a huge, superb monument which can be visited on the same day you go to the Colosseo, since it is located in the same area and offers an incredible beautiful view on the forum. Two glass elevators take visitors up to the top of the monument and let enjoy a fantastic 360 degree panorama of all of Rome. This can be a good alternative to the St.Peter’s Dome, being not tiring to climb. Green park with playground outside, beautiful and interesting castle inside. This monument well represents the ability or Rome into converting preexisting buildings to new purposes: built as a monumental tomb of the emperor Hadrian, during medieval age it was converted into a fortress where the pope could find the perfect shelter in the event of an enemy attack to the city. It’s still standing the overhead passage which connects the Vatican to Castel Sant’Angelo, which is called “passetto”. Kids will enjoy its round shape, the helical ramp and diameter ramp, the weapons, the narrow passages, interior courtyards, the beautiful large un-expected terrace on the top, and adults will be impressed by ornaments and will be tempted to have a break in the lovely cozy coffee shop. This monument it is just opposite to St.Peter square and just at a stone's throw from our apartments. Largo di Torre Argentina: Roman ruins filled with stray cats. Kids like play to looking for the cats among the stones and columns. You cannot going inside the place but look at it from the street level. One side it’s traffic free and equipped with benches, good enough to sit down and rest while kids point and shout as they eye-catch the cats. Villa Borghese: as mentioned above, there are something like five large parks in Rome, but the only closest one to the centre of Rome is Villa Borghese. Among all the others, it is the city park for excellence, perfect destination for sporty persons, sunday family strolls, busking spots, etc. There are plenty of things to do: you can rent a motor-assisted pedal cart family (4 seats or two seats) or better yet rent two and chase each other, you can also rent bikes, segways, small pedal cars, make a pony ride, get on board of an electric train, rent a row boat and row around the pond of Villa Borghese among turtles and ducks. Do not forget to bring bread with you to feed them! The Terrace of Pincio is a perfect place to enjoy the view of Rome and the best location to admire the sunset. Inside the park Villa Borghese there is the play center Casina di Raffaello, and in the northern area there is the Zoo (Bioparco di Roma). Finally, in via Flaminia 80, not far from the Villa Borghese there is Explora, a “museum” for children , which is a good plays to bring children in a rainy day or to dedicate a half day to them and for parents to get a little bit of relax when kids can paly in a safety, child-customized place. I cookie ci aiutano a fornire i nostri servizi, utilizzando tali servizi acconsenti all'utilizzo dei cookie da parte nostra.